All industrial sector must periodically evaluate the state of its production equipment, then to implement suitable maintenance program to guarantee its reliability and its availability. This concern already led Gaz de France (GDF) to define various diagnostic and rehabilitation programs, and more specifically those related to the overhead pipe crossings that could not be easily inspected. At the beginning of 1999, Gaz de France defined a new general maintenance policy. This policy contemplates, for the ten coming years, to inspect and then, if necessary, to rehabilitate 29.000 km of GDF transport pipes. increasingly strong constraints in regard with availability of the works, which will be exerted to the new "Transport Operator" to be set up soon. This situation is due to the prospective liberalization of the gas market, and in addition to the increasing international flux that relates to the startup of new transport line. The diagnosis of the state of the grid system is a complex and more or less random operation. Indeed it is difficult to expose all the lines lengthwise or of exploring them in their totality using instrumented gage (PIG)! For that reason, as an alternative, Gaz de France selected light NDT inspection methods. This choice makes possible to set the compromise between exhaustiveness and cost, to reduce as much as possible the random aspect, while minimizing the overall cost. In particular, if the cost of the possible replacement of a section of pipeline is very high - for example in case of crossing under railways, main highway or a river- it is essential to have dedicated tools that could provide accurate diagnosis to evaluate the relevance of the replacement. For these reasons, Gaz de France and INTERCONTROLE collaborated in the definition of a new inspection tool based on ultrasonic testing. This system is able to provide a precise cartography of a defect already located by an another technique. The present paper indicates the first results obtained with this tool, as well as the prospective developments considered. INTERCONTROLE is a company specialized in nondestructive testing method and equipment as part of the Nuclear Services Branch of FRAMATOME. The Company, which is one of the world leader as regards non-destructive testing, operates mainly in the nuclear power plant and focuses its activity in the testing of vessel and steam generators of pressure water reactor. The special features of the inspection machines necessary to carry out the nuclear work led INTERCONTROLE to gain experience and proficiency as regards engineering of NDT systems. 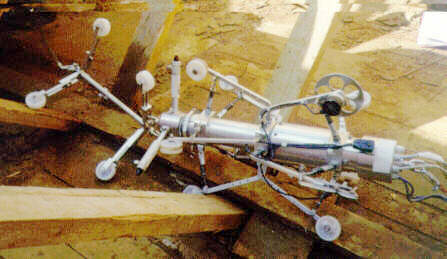 As an illustration, INTERCONTROLE developed for Gaz de France an NDT equipment called " Orbiscan ", which is intended for the automatic testing of welds of transport pipe by using ultrasonic technique. During the year 1996, a detecting magnetic gauge looking for metal losses was used in a 500-mm diameter line located in the Ile-de-France region (Paris area). This inspection highlighted certain defects with an assumed depth higher than 30% wall thickness. However, the first openings carried out revealed that the importance of the detected metal losses had been often approximately overestimated by a factor 2. Moreover, the more severe defects - because they imply a large in-service maximum pressure drop (PMS)- were located under a very borrowed railways. It was thus practically impossible to carry out an excavation to evaluate the main defect characteristics. The replacement of the crossing was evaluated about 800 000 €. An accurate measurement of the wall residual thickness in the zone considered, in order to confirm the measured depth of defect (about 50%), constituted a pivotal argument in the replacement decision-making. Ultrasonic technique makes possible to locally measure the thickness of metal with a good precision (± 0,1 mm or so). Consequently, Gaz de France called upon INTERCONTROLE to develop a testing tool to perform pipe inspection from the inside. The tool had to measure in a precise way the residual thickness of metal in a zone framing the defect that was previously located by the instrumented gage. The new tool named ENDOSCAN 2 was developed between March and June 1997 by the Engineering Department of INTERCONTROLE. It is designed to check and characterize defects already detected by another method in case it would be impossible to excavate the gas line. In order to characterize the depth affected by the defect, the NDT method is based on the measurement of wall thickness by processing UT data from the RF ultrasonic signal. This measurement is carried out point by point according a pre-selected acquisition pitch. To determine the longitudinal and angular extension of defect, it is necessary to size the measurement pitch according to the required resolution. Consequently, the pitch size defines a number of acquisition points along with the rotation of the tool and the longitudinal step motion. The reading of position encoders triggers the ultrasonic measurements. As a matter of fact, it is possible to cover the zone to be examined by moving the tool back and forth in the target zone. Results are displayed on the operator screen in the form of a deployed cartography (evolute) of the examined zone. It consists of a barrel, centered in the piping by using retractable arms. It is connected to outside by a tether cable and is traveled in the pipe by an external winch. The barrel carries a rotary arm that contains the ultrasonic sensors and a feedwater outlet tube for ensuring coupling of the ultrasonic beam. The transducers mounted at the end of the arm rotate at a short distance from the inner surface of the pipe (low lift-off). The probe moves along a helical curve due to the combination of the motion of the winch and the rotation of the arm. The ultrasonic shootings are triggered so as to obtain a measurement pitch of the surface. Two encoders (rotation and travel), which allow positioning of thickness values on the line cartography, supplement the UT head. The tether cable allows the outlet of the coupling water and serves as transmission line for command and measurement signals. Introduction of ENDOSCAN in the pipe requires aeration of the crossing line to be inspected, and the cutting of two 3-m long sections. The adjustment to the diameter to be examined and the calibration of UT measurement take place directly on the site. The setting up of this 30 kg tool is particularly simple and rapid in comparison with the necessary setting time for a 1-ton instrumented gage. Indeed one operator is sufficient to achieve the tasks of preparation and introduction. Once the line is dried and a towing cable posed, ENDOSCAN 2 is attached to the tractor cable of the winch and is shifted down to the zone to be tested. Its position is continuously monitored by the reading of odometric encoder. The tool is moved up to a pre-selected start position. Continuous data acquisition is carried out in a zone of approximately 500-mm length, framing the supposed defect (extension of the zone is only limited by the computer memory). Complementary measures are carried out at the very location of the nearest weld in order to confirm the position and the orientation of the defect. In addition to its simplicity of implementation and the achievable precision when sizing defects in the tested zone, ENDOSCAN 2 offers a really low-cost alternative approach in comparison with magnetic traditional gage. Indeed, the displacement of the ultrasonic probe along with a circular trajectory brings a decisive advantage in the detection of longitudinal defects because they are crossed several times and are not likely to escape between the detectors. The probability of detection of very harmful defects is largely improved. In addition, the operating cost and the inspection time are also much lower than in case of magnetic instrumented gage or traditional ultrasonic methods. in June 1997, on crossing line under railways as mentioned in paragraph 1.1: it made it possible to check the depth indicated previously by the gage, and to specify the shape and dimension of the wall corrosion attack. Defect was a long longitudinal scratch, undoubtedly consecutive to the introduction of the pipe in the metal sleeve. in July 1997, ENDOSCAN was operated for a Dn 600 line passing successively under a main highway and a railways. It was possible both to confirm the depth of a defect previously detected under the road crossing (by using the instrumented gage) and to highlight metal losses in certain flawed zones of cladding , located under railways, which were detected by external electrical measurements. Like in the preceding case, defects was longitudinal scratches but this time they were not detected by the magnetic flux leakage device of the gage. in April 1998, on an tested Dn 500 line crossing located under a river, ENDOSCAN made it possible to specify the depth and the geometry of a defect highlighted by instrumented gage. ENDOSCAN 2 is designed to test the residual thickness in a defective zone where the anomaly have been detected by an another method. It could be loss of metal located by a gage or wall corrosion attack within the cladding detected by electrical measurements from the surface. ENDOSCAN is more suitable for inspection of line that would not be, or with great difficulty, accessible by an excavation. The tool is well adapted to the expert appraisal of a crossing under railways, river or a highway, but also for zones where the gas line load factor would be very significant, making a possible excavation very expensive. Gaz de France and INTERCONTROLE decided to update the specification of the tool in order to integrate all the tested and validated evolutions leading to an reliable industrial product. To date, the planned evolution relates to the implementation of the new tool in terms of reliability improvement. It consists in revamping the prototype system and in sufficiently documenting it to make it ready-to-use by a service company. Extending its testing capacity to lines with nominal diameter ranging from 300 mm (12") to 900 mm (36") is scheduled. The actual detection and sizing performances will remain unchanged because the tool specification is designed for expert appraisal and characterization of gas lines. Longer term, GDF and INTERCONTROLE will work together on the specification for developing a new search and characterization UT tool. This prospective tool will be able to operate over a greater line length. One of the objectives is to exempt Gaz de France of using a magnetic instrumented gage for preliminary detection. This advanced tool will be named ENDOSCAN 3.